Luc Besson is a little more than halfway through shooting his latest beautiful sci-fi nonsense film, Valerian, so it seemed like as good a time as any to check in on the project, and see whether it’s hitting all the benchmarks on our “Luc Besson science fiction nonsense” checklist. 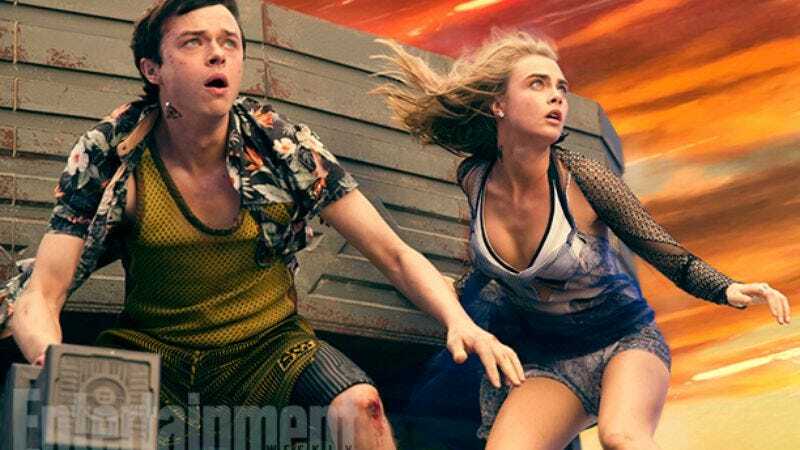 Luckily, Entertainment Weekly just ran a profile on the in-production movie—which stars Dane DeHaan and Cara Delevingne as gun-toting space spies, and is based on a French comic Besson fell in love with as a kid—that’s full of pictures we can use for our rigorous, scientific investigation. Okay, let’s start off with an easy one: Is there an attractive young cast clothed in stuff that blurs the line between “space fashion” and “fetish gear”? Next up: Are there glowing space corridors for said attractive cast to run through? Good, good, that all looks fine. Giant guns? Huge, phallus-like robots? Bingo! Okay, this is all looking pretty good. The only thing we’re really missing at this point is a big weird alien, and Besson is presumably keeping those characters—at least one of which will be voiced by John Goodman, and possibly Clive Owen—under his skintight white wraps until the movie’s closer to being done.